3 COMPLETE NOVELS FOR THE PRICE OF ONE “The Lambda Literary Awards (the “Lammys”) identify and celebrate the best lesbian, gay, bisexual and transgender books of the year and affirm that LGBTQ stories are part of the literature of the world.” www.lambdaliterary.org Three of the Rainey Bell Thriller novels in the five-book series have been honored as “Lammy” finalists. Here’s your chance to read those honorees in one bundled set. 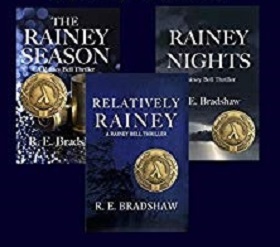 Included are Books 2, 3, and 5 in the series: Rainey Nights (2012), The Rainey Season (2014), and Relatively Rainey (2016). 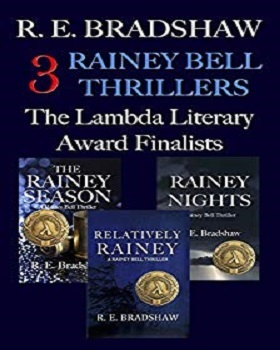 Rainey Blue Bell is a retired former Behavioral Analysts with the FBI. The series follows her life after the FBI. They can be read in order or as stand-alone crime novels. Though the series has moments of family love and levity, these books are not for the faint of heart. After all, the topic is murder more than foul. Lock the doors, check the windows, and dive into Rainey Bell's world of darkness.